There have been around 222 school shootings in the U.S. since Columbine in 1999. According to The Washington Post, ever since that detrimental massacre a total of 143 students, teachers, and staff members’ lives have been lost. These numbers are appalling, so why is it that school shootings have become so normalized in America? Why hasn’t a long overdue change come? As alarming as it is, America seems to have grown numb to the severity of not only school shootings, but of any mass shootings. One of the main issues that always resurfaces after any mass shooting, especially school shootings, is mental illness and the role it plays in these tragedies. Although scapegoating mental health for these massacres seems to be a trend, no one seems to be digging deeper. The realization that these tragedies could have been, and still can be, prevented if we as individuals paid more attention to the well-being of each other, needs to be talked about. Even then, if clear red flags that someone is not mentally stable are brought to the attention of an authority figure, what do the people in power do? According to The New York Times, Federal law states that individuals who have been involuntarily committed to psychiatric hospitals and people who’ve been found to be a danger to themselves or others are forbidden from legally carrying weapons. This system depends on the states to report these red flags in order to add them to the nation’s background checking system. The states in turn depend on its citizens to bring individuals who show signs that they might be a danger to themselves or to others to their attention. Our nation has developed a cycle of grief that’s repeated every single time an individual loses their life to gun violence. We grieve the deaths. Our elected officials grieve with us. We call for change, such as stricter gun regulations, background checks, or anything to keep kids safe. Yet cries go unheard and slowly fade away as time goes on. That is, of course, until the next shooting. As the death tolls tally up, major change doesn’t seem to follow. It goes without saying that many individuals have pushed for change. The March For Our Lives movement that began following the school shooting in Parkland Florida, where 17 individuals lost their lives to an AR-15 assault rifle, garnered a lot of support from the youth of our nation. The march took place in Washington D.C. as well as 800 other sibling events throughout the States and is now regarded as one of the biggest youth-led protests. 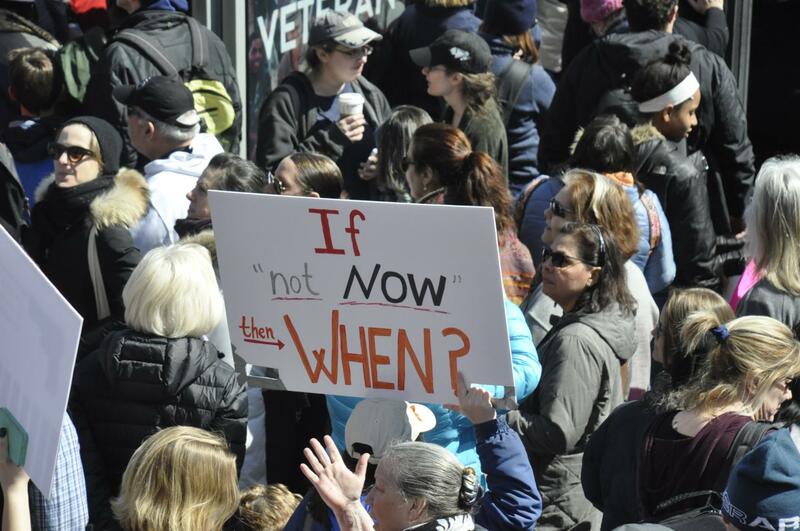 Protestors urged for more universal background checks on all gun purchases and a ban on high capacity magazines. Even this strong push has faded in intensity with time. Reports from the Washington Post show more than 219,000 students have experienced gun violence at their school. No teenager or child should have to worry about loosing their life anywhere, especially at school, a place we are required to come and learn. Clearly, much of the youth of our nation sees the problem and are fed up. We’re the ones being directly affected by school shootings. Our own Wakefield community has taken actions of their own with regards to standing up to gun violence in schools. Last year after the devastating Parkland shooting, Wakefield held two walkouts. The one that was immediately after Parkland was the most impactful. Everyone was ready to make change. The second one, a month later, was not as well attended and not taken as seriously. Many suggest “solutions” for gun violence that just seem to miss the point. Buying a bulletproof backpack, requiring students’ to carry only clear backpacks, or mandating that school districts have metal detectors at all entrances puts the burden on those who shouldn’t have to bear it. We should not accept gun violence in schools as a norm in our country. There shouldn’t even be the slightest possibility that once a child walks through school doors they could end up losing their life. Instead, we should all look to why these tragedies are occurring and collectively rise up. We can’t shout “no more” for only one day and one march. If we really want to see a change, we must push for concrete cultural and political change. The majority of Americans support universal background checks; why is this not reflected in the decisions our representatives make? While we may feel as though our voices don’t matter as students, there are many ways we can make ourselves heard. For the few of us that can vote, it’s crucial that we exercise that right and stay informed. And for those of us who can’t yet, we can still hold our representatives accountable and work to educate others. Gun violence should not be a divisive issue. The path between the right to bear arms and the right to live should not be so wide. Common ground is where progress is made, and by listening to and respecting each other, we can all come together to make our voices heard and find a solution that respects both our right to life and law-abiding citizens’ right to bear arms. Want to make a difference? Click here to learn what you can do.